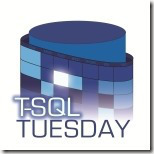 Hello all and welcome to a new #tsql2sday event that I’m proudly hosting for this month. #tsql2sday is a monthly blog party on the second Tuesday of each month. Everyone is welcome to participate, so no matters you are an experienced blogger or you just want to start writing about SQL Server, this is a real good chance to add something to the community. There a few rules to participate in this party, nothing complicated but let’s remind them to everyone. I really look forward to reading your blog posts. Thanks for hosting this – I’ve taken the opportunity to add my voice in the war on table variables! This promises to be a very interesting topic. Looking forward to the responses.